Udupi, March 25, 2017: In 2008 she took a hard decision when she quit her job in ISRO to pursue her dreams of becoming an IAS officer. A year later she cracked the IAS exams and became one of Kerala’s three toppers by securing the 54th rank. 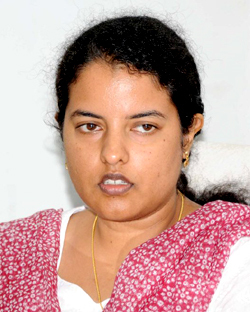 At present, she is the Deputy Commissioner of Udupi district. Yes, the reference is to Priyanka Mary Francis who recently was appointed Deputy Commissioner of Udupi. An IAS officer of the 2009 batch, Priyanka has a B.Tech degree in Electronics and Instrumentation. Hailing from Tiruvanthapuram, becoming an IAS officer was a childhood dream which she chased to perfection. After being successful in IAS exams she was posted as Assistant Commissioner of Belgaum and later in 2012 she was promoted as Commissioner of Belgaum City Corporation, thus becoming its first lady Commissioner. In November 2015, Priyanka Mary Francis was appointed as Chief Executive Officer of Udupi Zilla Panchayat, a post which she handled with great diligence and responsibility. Now as the DC of Udupi, she also holds the additional responsibility of ZP CEO and promises to give top priority to solving drinking water problem. Priyanka also assures to study the sand extraction issue and find a solution to the problems. Udupi has pinned high hopes on its new DC.